Peter Sloane (Anton Rodgers) is the leader of a group of rich and bored young people who turn to crime in order to relieve their ennui. Sloane becomes addicted to random acts of violence, but whilst he appears to have no conscience, others, such as Tim Coles (Derek Fowlds), aren’t so cold-blooded. And as they begin to squabble amongst themselves, Gideon and the others start to close in …. 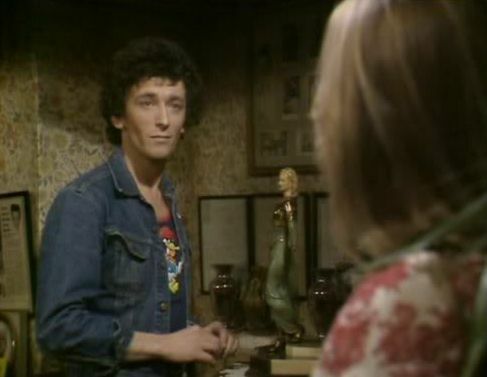 Whilst it’s true that the first sight we have of Sloane is likely to elicit more of a smile than terror (with his Beatle wig and dark glasses) his instability is quickly demonstrated after he and Sue Young (Annette Andre) rob a greasy spoon cafe. The owners are a friendly-looking couple in their fifties, which gives Sloane’s attack on the man and woman even more of an impact. It’s no surprise that we don’t see the blows delivered to the woman, but director John Llewellyn Moxey still ensures the scene carries a punch by cutting away to Sue’s face. She watches Sloane’s attack with a degree of amusement, which also serves as shorthand to indicate she’s on a similar wavelength to him. When Keen looks in on the crime scene on his way home (with, naturally, a beautiful young woman in tow) he reacts with a degree of bitter humour after Det. Insp. Caldwell (Roddy McMillan) suggests that the attack could be the work of teenagers, doing it for kicks. If it is, then Keen indicates that even if they’re caught they’ll face no particular punishment. Caldwell agrees as he ironically tells Keen to “remember, teenage crime is an environmental problem.” It’s a rare example of cynicism in the series, since it suggests that sometimes crime does pay. Anton Rodgers might have been pushing it a bit by attempting to play a young tearaway (he was in his early thirties at the time) but though he’s a tad long in the tooth he’s still very compelling. Sloane’s arrogance and unswerving belief in his own invulnerability are captured well by Rodgers and this makes his eventual downfall even more satisfying. Derek Fowlds has a good role as Coles, the only member of the gang with a conscience, whilst James Hunter (star of an excellent episode of Out of the Unknown – Thirteen to Centaurus) has less to do but still has a few key scenes, especially when Sloane suggests they rob King’s aunt and uncle. The long arm of coincidence sees Keen’s latest girlfriend Elspeth McRae (Jean Marsh) invited to the next party aboard Sloane’s houseboat by Sue (both are models). When Keen learns about it he also goes along, as by now the police have got an interest in Sloane. Keen and Elspeth share a similar discussion about young people to George and Kate Gideon – and with similar results, Keen is pessimistic whilst Elspeth is optimistic. Gideon’s Way was never a social-realism series, so the theme of youth crime (violence, drink, drugs) does end up being handled a little uneasily. But whilst no-one could mistake this for an episode of 1970’s crime dramas like The Sweeney or Target, it does possess an undeniable period charm, helped by the first-rate guest cast. And thanks to the likes of Rodgers and Fowlds this is one of the strongest episodes out of the twenty six made. Mrs St. Clair (Anna Cropper) has travelled to London to conduct some business. On her way back to the train station, she passes through Upper Swandam Lane (home to a notorious opium den). Mrs St. Clair is astonished to see her husband briefly at the upper window of this disreputable place – but a second later he vanishes (as if pulled back by some unseen hand). Neville St. Clair is a respected journalist who would have no reason to visit such a dive – unless he was a secret opium addict. When Mrs St. Clair returns with the police they find no trace of her husband, although in the upstairs room they do discover a box of children’s blocks. Mrs St. Clair collapses, as her husband told her he planned to buy such a toy for one of their children that very day. Mr St. Clair’s clothes are also discovered. All the evidence suggests that a well-known beggar, Hugh Boone (Anton Rodgers), was with Mr St. Clair when he was spotted by his wife. Boone is quickly picked up by the police, but he’s saying nothing. Holmes is convinced that Boone holds the key to Neville St. Clair’s disappearance – which he does, although Holmes’ solution is a most unexpected one. The Man with the Twisted Lip was one of the original batch of Sherlock Holmes short stories, published in the Strand Magazine in December 1891. Jan Read’s dramatisation is pretty faithful to the source material, but it’s a pity that the original, striking, opening wasn’t used. In Doyle’s story, Watson travels to the opium den to extract a friend of his, Isa Whitney, who has fallen under the thrall of the drug. When he’s leading his friend outside, he’s accosted by an old man (who turns out to be Holmes in disguise). Holmes then explains that he’s investigating the disappearance of Neville St. Clair. In Read’s adaptation, Watson does discover a disguised Holmes, but it sits rather uneasily in the middle of the story (where it makes less sense). Although his screen-time is quite limited, Anton Rodgers is very effective as the disfigured beggar, Hugh Boone. Anna Cropper, as Mrs St. Clair, is the latest stoic beauty to turn to Holmes for help. A sign that retakes were only undertaken in the gravest circumstances is demonstrated by the scene where Mrs St. Clair visits Baker Street. After lifting the veil from her hat, it falls down again and she simply has to push it back up and carry on. Given the small pool of ethnic actors working in the UK during the period, it was very common to see British actors playing characters of every nationality. Here we see Olaf Pooley (as the villainous Lascar) browned up. To modern eyes it may seem strange, but it wasn’t an unusual occurrence at the time. The Man with the Twisted Lip benefits from some atmospheric location filming in the East End. The story could have been shot entirely in the studio, but the real locations certainly add something to the end product. Within a few years redevelopment would have changed the locations beyond all recognition, so they were used at just the right time. The first story of the series to be made (it was recorded in September 1964) it’s a very efficient production. Given that the majority of the stories adapted for this series were later also adapted for the Granada series, it’s difficult to avoid comparing the two. It’s slightly unfair though, since the Granada series had a much larger budget and therefore it would always score highly, particularly in a visual sense. But whilst the Wilmer series has more modest production values, it can certainly hold its own performance wise, and in the end it’s the performances that really matter. General Weston (Peter Jones) is the autocratic chairman of a small merchant bank. He wishes to initiate a merger (which effectively means selling the bank). His fellow directors and his son Tony (Peter Egan) are against the plan, but the General always gets his way – and he does so again. But shortly afterwards, he falls down the bank’s lift shaft. As Tony later remarks, anybody else would have broken their neck, but he escaped with just a sprained arm. However, it does seem to indicate that somebody at the bank wishes him harm. There’s no shortage of suspects. His son would inherit everything on his death, whilst the vampish Julie Prentiss (Michele Dotrice) seems to have the General wrapped around her little finger. The other directors, Rodney Tyce (Graham Crowden), Ian Rentoul (Ronald MacLeod) and Agnes Courtney (Gillian Raine), could all have motives whilst the servant Dobbs (Norman Chappell) is another possibility. Tony is a regular client of Esther’s and he calls on her to ask for advice. He wants to leave the bank and break free from his father – but only if she confirms that the stars are correctly aligned. She visits him at the bank to deliver the horoscope and he suggests they have a drink. It comes as something of a surprise to find the General frozen solid in the fridge ….. The Horns of the Moon is by far the best mystery of the series since, as the above list indicates, there’s no shortage of suspects. Once again, Esther is at the scene of the crime when the body is discovered, much to Gradley’s despair. He’s also a little peeved at having to leave his dinner companion. “You may not know it but I was at a charity dinner, escorting a debutante of the year.” When Esther asks which year, he tells her it was quite a recent vintage. Tony protests his innocence – he looks guilty, but that’s only because somebody has framed him. Later on, even more evidence pointing to his guilt comes to light and Gradley arrests him. Esther remains unconvinced and continues to nag at him to consider the other possibilities. As with all the episodes, there’s a lovely group of actors here. It’s a shame that Peter Jones doesn’t last longer as he’s got some nice comic business as the General. Peter Egan is a bundle of nerves as the perpetually twitchy Tony whilst Graham Crowden is quite restrained as Tyce. Tyce is a character that exists on the outskirts of the majority of the story, but he does have a part to play later on. The banter between Gradley and Esther also helps to keep the interest chugging along. Both of them, especially Anton Rodgers, have great comic timing and it’s their partnership which is one of the main strengths of the show. The Horns of the Moon was the final story of this short series. The real murderer is eventually found and Tony is set free, but that’s the end of the line for Gradley and Esther. The premise of the series (detective and astrologer teamed up) was an intriguing one, although it’s fair to say that some of the plotting was a little loose in several of the episodes . The partnership between Hempel and Rodgers as well as the guest casts more than made up for this though and there was certainly enough potential for a further run of episodes. It wasn’t to be though, which is a shame since Zodiac is a nice little series and provided you don’t mind studio-bound drama (not a single location shot in the six episodes) it’s well worth tracking down. Zodiac – Sting, Sting, Scorpio! Madame Lavengro (Anne Dyson) is a fortune-teller who lives and works in Brighton. Two maids from a local hotel visit her for a reading. Brenda (Jeananne Crowley) waits in the other room whilst Peggy (Susie Blake) goes first. Whilst she looks like the archetypal fake fortune-teller (complete with headscarf and crystal ball) it’s clear that she has genuine insight. She knows that Peggy has problems with her boyfriend and that he possesses money that doesn’t belong to him. A moment later she realises that he’s the Brighton Hotel robber. Like Peggy, her boyfriend Brian (Robert Powell) works at the same hotel. He knows that he has to silence the fortune-teller – which he does. The day after, Esther pays a visit to Madame Lavengro and discovers her body. Esther was a friend and admirer of Madame Lavengro, so she takes the lease on her shop and tells Gradley she’s determined to track down her murderer. Esther’s in something of a huff with Gradley as he’s reluctant to get involved in the case (it’s well outside his patch). He does eventually travel down to join her, after taking some leave, but they still indulge in a good deal of bickering once they do team up. There’s also another sighting of Anton Rodgers in denim (not good) and later he sports an interesting cravat (also not good). A curly-headed Robert Powell is the villain of the piece. He’s not really known for playing baddies, which is probably why the character doesn’t quite have the dangerous edge he should have. The rest of the cast also features some familiar faces. Wensley Pithey (a regular in the early series of Special Branch) is Inspector Duggan, Susie Blake is the sadly doomed Peggy and Frank Gatliff brightens up the screen briefly as the camp-as-anything Felix Pettigrew. Another eyebrow raising performance is given by Bob Sherman as the hippy singer Bob Thomas. Sherman’s probably best known for playing an American spook in The Sandbaggers, so this role is something rather different. Although the 1960’s was long over by this point, Thomas is obviously a throwback (“Yeah baby, I’d really freak out man”). He doesn’t contribute anything to the plot, but he’s a nice bit of local colour. Anouska Hempel obviously had a cold whilst the story was being recorded, as her voice is pretty strained at times. This is referred to right at the end, presumably via an adlib, as Gradley declines to kiss her because of her cold and she threatens to spit all over him! Sting, Sting, Scorpion! is a nicely plotted tale. There’s one example of Esther’s special powers (she receives a vision that Peggy has drowned) but that doesn’t affect the solving of the crime too much, so it isn’t a particularly large cheat. Another strongly-cast and well-acted story. Richard Meade (Peter Vaughan) is awoken by noises from the flat opposite. He opens his bedroom window to investigate and is shocked to see a man attacking a woman. He rushes to the phone, but then stops – the woman sharing his bed isn’t his wife and since he’s an MP he can’t afford any scandal. Next day, Gradley visits him to ask if he saw anything the previous night. Meade responds in the negative. A few days later, Esther is entertaining Meade’s daughter Deborah (Joanna David), her mother Susan (Dinah Sheridan) and Deborah’s new boyfriend Martin Seacombe (Ian Ogilvy). Martin is a smooth-talker, but he doesn’t believe in astrology – which causes Esther’s hackles to rise slightly. One of her gifts is an ability to tell the star-sign of anybody, just by looking at them. She declares that Martin is a Scorpio, but he tells her he was born in May – which would make him an Aries. Esther simply doesn’t believe him or that she could be so wrong. His insistence would already be enough to mark him out as a wrong ‘un, but he was also the man we saw at the start, committing the murder, so he’s clearly going to be the villain of the piece. When Meade arrives to pick up his wife and daughter he’s shocked to see Martin with his daughter. He knows the man’s a murderer, but if he tells anybody then the story of his infidelity will come to light, and this puts him in something of a quandary. Saturn’s Rewards isn’t the first episode of Zodiac to use some outrageous coincidences, but the ones here are worth repeating. Meade’s daughter’s fiance chooses to commit a murder in the flat opposite Meade (it’s never explained why he’s in that flat). Gradley is the detective assigned to investigate the murder, whilst Esther is an old friend of Meade’s daughter, Deborah, which is how Esther becomes involved. Too many coincidences! The studio-bound nature of the production becomes rather apparent when we see the murder committed. The gap between the two flats isn’t very wide and it’s impossible to believe that Martin didn’t see Meade looking at him. Obviously he didn’t, otherwise the story simply wouldn’t work, but the camerawork seems to imply otherwise. Whilst the plot has its problems, we can take solace with the cast. Peter Vaughan is good fun as a rather shifty, untrustworthy politician and Ian Ogilvy (complete with a moustache that may be fake, I think it is) is the charming, but dangerous Martin. Joanna David and Dinah Sheridan have less to do, but having two good actresses in those roles is some consolation for their slightly underwritten parts. Undeniably, this is clumsily plotted, but once again the performances of both the regulars and the guest cast manage to make something out of the fairly thin material. Paul Derring (Norman Eshley) is a smooth-talking conman who targets beautiful, young, upper-class women. He spies his latest mark, Elizabeth Charmont (Jenny Hanley), and moves in. Elizabeth has never met him before – but he seems to know everything about her. “Although we’ve never met, I know you. There is an empathy between us.” He goes on to tell her things about herself that no stranger could possibly know. Initially it seems that he’s an astrologer like Esther, but it turns out he’s been abusing Esther’s gifts for his own ends – which proves to be his downfall. Since Esther writes a successful horoscope column (under the name of “Sibyl”) she receives many requests for personal horoscopes. One such letter strikes a chord and she suddenly realises that recently she’s been sent numerous pleas for horoscopes – apparently from different people – but now it dawns on her that they’ve all come from the same person. The names are different each time, but a handwriting expert called Toby (Charles Lloyd Pack) confirms that the signatures are all from the same hand. So Esther calls in Gradley – she wants to find out who’s been doing this and why. Since the opening of the story is Esther-centric, Gradley doesn’t appear until thirteen minutes in – but it’s worth waiting for, as Anton Rodgers is a vision in denim. Maybe he was dressed down in order to make Hempel (who’s wearing a rather nice black evening dress) look even more stunning? Esther shows him the letters and they decide that the first one – sent by a Paul Derring – is probably genuine. So can they locate Derring? The system he’s worked out to provide himself with victims is quite neat – he has a confederate called Penny (Deborah Norton) who works at a flower shop which is frequented by the upper-classes. Whenever somebody visits to buy flowers for a likely target’s birthday, Penny makes a note of their birth-date and address and passes the information onto Derring. He then requests a horoscope from Esther and therefore is able to astound his latest conquest with a host of impressive facts about their life. Philip Broadley’s script follows the template laid down by Roger Marshall’s first two stories. There’s plenty of banter between the two leads and a general lightness of touch throughout. Whilst Derring is a conman, he also has a sense of humour and the script and direction help to accentuate this by throwing in the odd, wrong-footing moment. My favourite is the scene that opens with a close-up on Derring’s face. He looks quite serious, but as the camera pans down it becomes clear that he’s merely standing in his underpants, ironing his trousers! The obvious plan is for Esther to present herself to Derring as his latest victim, which causes Gradley a little pain as she artfully stokes up his jealousy by casually mentioning how charming Derring is. Fashion-wise, Hempel sports a variety of costumes, from the aforementioned black dress to a towel (and looks good in all of them). Thankfully, Rodgers’ denim interlude is quite brief and he spends the rest of the story more conventionally attired. One unusual thing about the series to date is that it’s completely studio-bound. 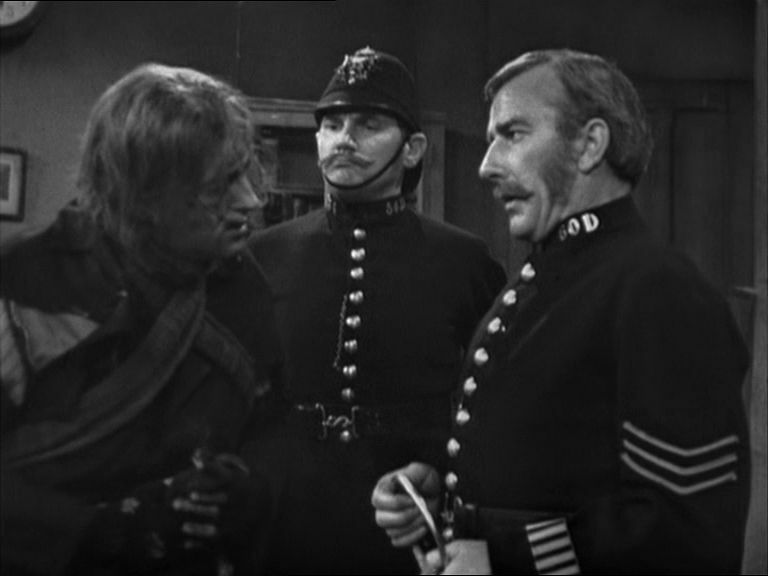 It wasn’t unheard of for some 1960’s series (like Sergeant Cork) to be almost entirely recorded in the studio (although that, I assume, was probably due to the show’s Victorian setting – it would have been difficult to film outside without major redressing of most locations). Since Zodiac was a contemporary series, that problem didn’t apply – and the lack of location work does make the programme feel a little claustrophobic at times. Whilst Gradley was a confirmed astrological sceptic in Death of a Crab, at the start of this episode he seems to have revised his opinion somewhat when he calls on Esther to ask her advice. Of course, it just might be that he wants to spend more time in the delectable Ms Jones’ company – which is completely understandable. Whilst Gradley is left to ponder on this problem, the episode develops two seperate plot-lines. The first concerns two businessmen – Reuben Keiser (Michael Gambon) and Mark Braun (George Baker). They’re very different types – Keiser is somewhat sharp and unscrupulous (as he says himself he’s “more barrow boy than Harrow boy”) whilst Braun is more refined and keener to do the right thing. The second sees Gradley pay a visit on George and Paula Sutton (Bill Maynard and Betty Alberge). Their niece, Sheila, has disappeared and shortly afterwards they receive a note to say she’s been kidnapped. The two plot-threads converge when Kesier receives a ransom note. He’s never met Sheila, but unless he pays one hundred thousand pounds the girl will die. As the kidnap happened on Thursday evening, Esther wonders if this is the job that Gradley received a tip-off about. Although that does seem unlikely, since it transpires the kidnap was a one-person job – why would they inform on themselves? Remarkable coincidence number one is that Esther already knows Keiser and Braun (she’s supplied both of them with astrological readings). Remarkable coincidence number two is that when Braun persuades Keiser to call the police, it’s Gradley who’s assigned to the case. Like Death of a Crab, the solution to the mystery isn’t particularly taxing, but producing a baffling puzzle doesn’t seem to be this series’ raison-d’etre. Instead, Marshall’s script focuses more on the characters, especially Gradley and Esther. Just two episodes in, there’s an obvious “will they, won’t they” vibe about their relationship. The story boasts a cracking guest cast. Gambon and Baker are two actors that enhance any production and whilst Bill Maynard’s role is a little more serious than many of his signature parts, it’s still a pleasure to see him. He does have one good comic scene though, when he and his wife manage to give a description of Sheila to Gradley that takes an age – mainly because they can’t agree on the most basic questions (her height, whether she’s pale or not, etc). Also well worth watching is the ever dependable Trevor Baxter as Esther’s temporary butler, Neville. He proves to be an invaluable help to Gradley (picking out a few clues from the ransom note) and Gradley’s way of thanking him seems to involve putting on an apron and helping him clean the silver! Esther saves the day by casting a horoscope which leads the police to the place where Sheila is being held. This is a slight cop-out and is probably one of the series’ main flaws. As previously mentioned, the temptation to use Esther to pull a rabbit out of the hat can be damaging to the integrity of the narrative. But although this is a problem and the mystery isn’t that mysterious at all, The Cool Aquarian is still an enjoyable fifty minutes.